I love using essential oils so I decided to learn essential oil extraction techniques using a stovetop still so I could use up my extra herbs I grow. Instead of spending money to buy essential oils, I can use what I grow to scent the various homemade bath and body products I make. Best of all, I know my herbs are grown organically. Learning how to use a still to stem distill essential oils from herbs is not difficult. I chose to go with a regular still instead of an essential oil still because of money constraints. My goal was to have a working still and for around $100 that is what I got. Here is a really short video I did showing the process of distilling mint. It was necessary to use hardware cloth to create a square block to sit in the bottom of the still and a round “basket” to sit on top of the square block. I chose to use hardware cloth to create the block so I had more room in the bottom of the still for water. The purpose of this is to elevate the plant material above the water so the steam flows through the plant material and up into the copper tubing where it then drips down into a glass jar. I use a half gallon canning jar and it works fine. The liquid that drips down contains both hydrosol and essential oil. Anyone who grows Melissa commonly known as lemon balm knows it can really take over! 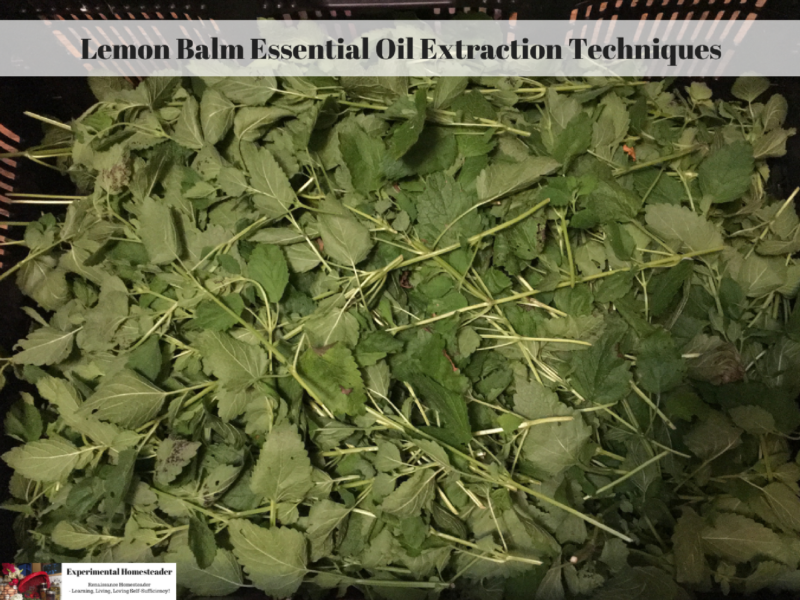 Since I had such an abundance of lemon balm, I harvested it early in the morning before the essential oils started to naturally evaporate. Watch what you harvest for signs of bugs or dirt. I usually dispose of any bug infested plants and quickly rinse off any dirty plants. Once the lemon balm was harvested, I brought it indoors and let it “wilt” for a few hours while I did my research on steam distillation for this particular plants. Each plant has its own vaporization point. All of the information I found stated that lemon balm vaporized at 172 degrees Fahrenheit. It also said the most pungent oil came over right before the water in the still begins to boil. My experience proved that – with my still – nothing came over until the temperature hit 209 degrees Fahrenheit. As soon as I saw the liquid beginning to drip I held the temperature at that throughout the distillation process. Here is my step by step technique. Allow plant material to wilt slightly. This seems to help the essential oils come to the surface of the plant material. At least in my experience. Place the square hardware cloth block in the bottom of the still. Fill the still with water to within about 1/2 inch away from the top of the block. Place plant material (I used the stems and leaves both) into the wire basket. Place the wire basket on top of the square block. Put the lid on the still and secure it. Position the glass jar so the copper tube fits inside it then cover the top of the jar with aluminum foil. Some of the aluminum foil is going to wrap around the bottom edge of the copper tubing. The idea is to keep any of the essential oils dripping into the glass jar from evaporating. Make sure there is ice and cold water in the bowl the submersible pump is in. Plug in the submersible pump and make sure the cold water is circulating. Go ahead and turn on the stove so the still begins to heat up. I set my stove on the number 2 – which is low heat on my stove – and it was the perfect setting. The still was a little slow to heat up but I did not have to adjust the heat and try to lower the temperature inside the still later on. Bring the still temperature up to 209 degrees Fahrenheit and hold it there. Allow the still to cool down on its own. Remove the still lid and then remove the spent plant material. The plant material is compostable. At this point if you have more of the same plant material to distill, add more water to the bottom of the still, add the fresh plant material to the basket and start over using the same process. I hope I have explained this topic well enough for you to . If you have questions or comments, please leave those below. Enjoyed reading the articles.Explain everything in details.Thanks for sharing. Have you ever let it just steep in alcohol to get the benefits? I don’t have a still. Hi Carol! I have not done that with lemon balm but I have done it it with Stevia to make an extract. I am sure it would work. I have seen recipes saying you can do that with various herbs. Another option would be to make a homemade wine or other alcoholic product.